Interested to hear of the latest on speech technology from a leading technology partner? Or perhaps, you’d like to meet with fellow speech tech enthusiasts like yourselves? Join us for our upcoming inaugural Technology Forum on 25th March 2019. Organised in partnership with Alibaba, the Speech Technology Forum will have Dr. Ma Bin, Alibaba’s Principal Engineer, R&D Centre Singapore, Machine Intelligence Technology sharing with us the Speech and Language Processing Technology at Alibaba. Dr. Ma will also talk about the benefits and deployments of the technology, and address the challenges as well as the future trend of the technology. It will be a great opportunity to interact with speech app developers and technologists, catching up with the current happenings and staying at the forefront of speech technologies. There will also be food, drinks and networking with fellow enthusiasts in the speech tech community. So what are you waiting for? Please register by 18th March, to confirm your place for the event! Hope to see you on 25th March, at PIXEL Building, 10 Central Exchange Green, Singapore 138649. 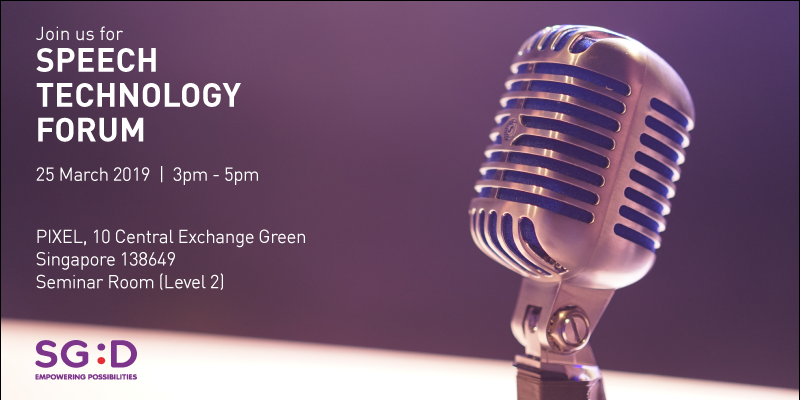 PS: Technology Forum is a series of events, organised by IMDA’s Digital Services Lab, that brings together the tech community, developers and technologists, with a shared belief that forefront technologies can and will transform the world we live in.